KeePass Password Safe is a popular, open-source password manager that lets you safely store all your password and access them with a master password. If you’re a KeePass Password Safe user, or want to become one, you should definitely pair it with KPEnhancedEntryView. 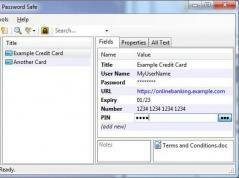 This is a free plugin for KeePass Password Safe that makes password management easier. It provides users with an improved grid view offering a simpler, faster way to add new fields, insert attachments and edit files that are protected by password. Also, metadata properties are displayed in a dedicated tab. A tool that allows you to have a different password for all the different programs and websites.